Time, money, material and expertise are invested here. The reworking of circuit boards is therefore even more important, in order to sustainably maintain this added value. A high level of know-how and the latest equipment are absolute necessities for professionally handling this work, especially when the boards are “Big Boards” measuring 24 x 24 inches. Therefore the right rework system must have the right features in order to ensure efficient and successful reworking. Due to circuit board size and weight, we developed a variety of supportive solutions for reworking 24 x 24 inch PCBs so that the positioning of “Big Boards” of various sizes is possible with a minimum of effort. The assembly fixture and flexible mounts enable easy placement of the circuit board above the Infrared (IR) Matrix Heater’s 25 zones, ensuring homogeneous heating of the assembly. We have developed a unique 25 zone IR Matrix Heater with a total output of 15 kW to heat the bottom of the circuit board. Each zone can be controlled individually, not only by adjusting the temperature of the zones, but also by switching off complete zones when not needed. It is possible to create Hot Spots where the heat output is targeted specifically to one component or apply homogeneous heat output across the entire circuit board. With our high-precision and fully automatic axis system, we enable the accurate placement of new components. The fully automatic pick-and-place process is supported by a variety of software functions, which allow the user to precisely position and place components on the solder pads. 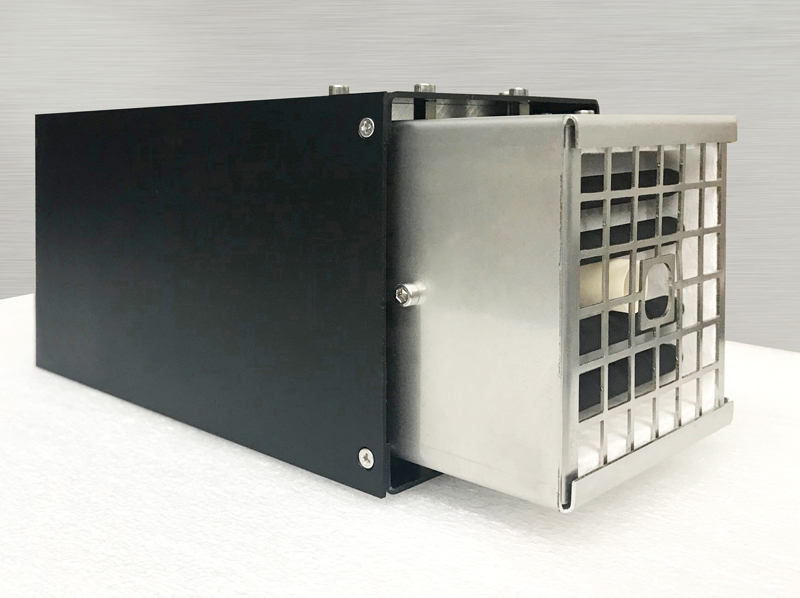 Thanks to our hybrid heater consisting of medium-wave infrared radiators we ensure a gentle and homogeneous heat transfer to the top-side of the assembly. Due to the additional energy input with hot air from above, components are heated much faster and more target-oriented. Our smart functions such as the foldable drawer system for arranging support pins will help you with the rework of big boards. The same applies to software: HRSoft 2 allows for easy setup and intuitive operation of the entire process. For example, heat curve template profiles can be selected and adjusted individually. The HR 600 XL unites all the features for successful reworking of large circuit boards. The material-protective and stress-free heating of an assembly is essential for successful rework processes. Therefore, the HR 600 XL has an 800 W hybrid heating head that combines proven radiation heat with a proportion of convection. Through additional energy output by means of hot air, components are heated even faster and target-focused. An efficient repair process is thus ensured. It should be emphasized that in comparison to hot gas systems air flow is kept low, eliminating adjacent component damage caused by jets streaming out and chips moved out of position from reflowing. The hybrid system can shield sensitive areas on the board, in order to keep them below melting temperature. These areas can be protected with air deflectors, foil or heat-absorbing material. 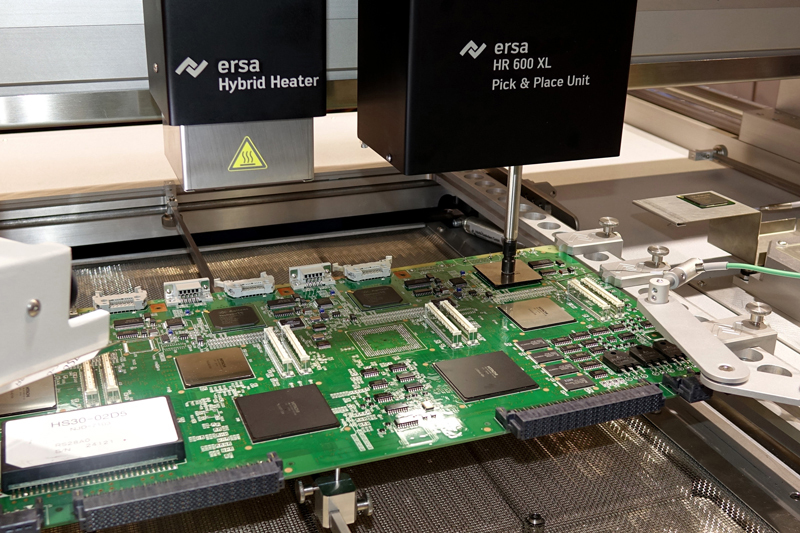 Together with closed-loop control, Ersa rework systems offer the most accurate technology for repairing modern SMT assemblies. 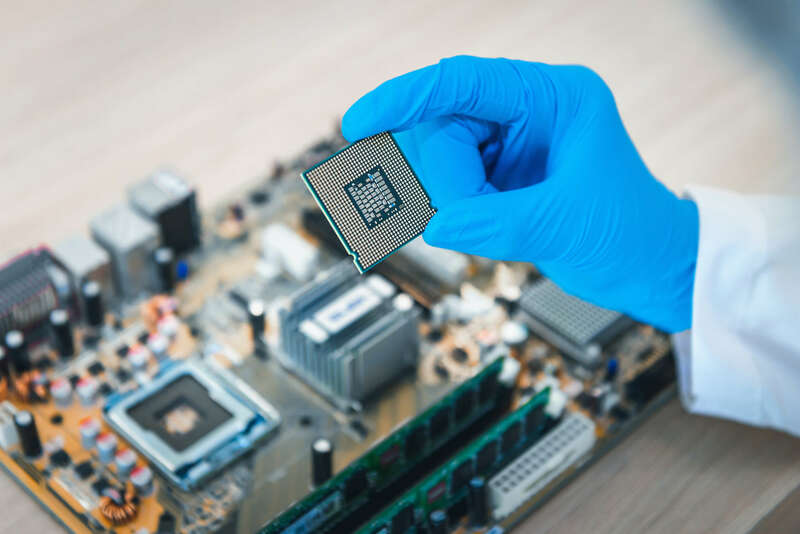 There are virtually no restrictions placed on applications: Metallic shielding plates and SMD connectors as well as sockets can also be processed as easily as large BGA components, small MLFs, sensitive LEDs or 01005 chips. From BGAs and QFNs through 01005 chips: all common components can be reliably picked and placed by the placing head. The head for mounting components and heater are attached to a high-precision axis with repeatable accuracy of +/- 10 microns. After the component is picked up, the placing head dips the component in a solder paste or flux depot. Following this, the component is placed and soldered. Thanks to this fully automatic, high-precision process, the quantity of solder paste can be well defined. Consequently, for multiple applications a high standard of reproducibility can be achieved. Due to outstanding clarity and the intuitive operation, the HR 600 XL can be quickly employed for a variety of rework tasks. All process steps of the work operation are logically displayed and can be quickly and reliably implemented. The user guidance Enhanced Visual Assistant (EVA) guides the user through all steps of the soldering in and out process and guarantees efficient error-free reworking. The application of solder paste to the component is also supported. All rework operations and associated soldering or desoldering parameters are documented, ensuring reliable traceability at all times. 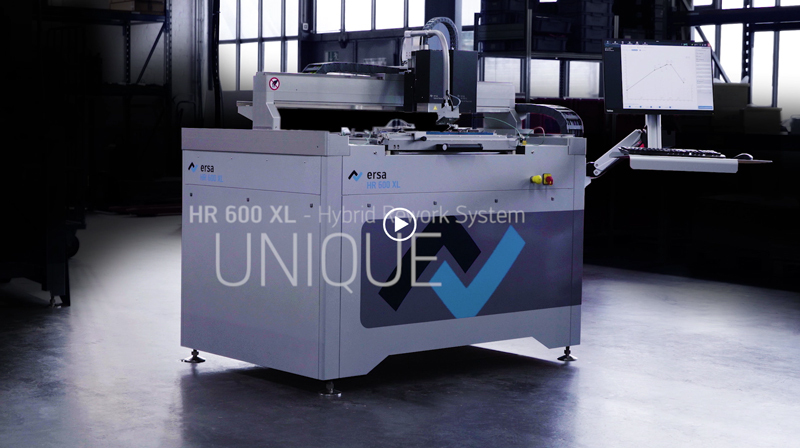 The HR 600 XL is equipped with a drawer system for easier handling of assemblies up to 24 x24 inches. The circuit board is inserted in the frame, which is positioned above 25 heating cells and adjusted with flexible mounts. The entire drawer can be pulled out and raised upright to effortlessly position support pins under the circuit board. After the drawer and assembly are pushed back to the horizontal starting position the rework process begins. 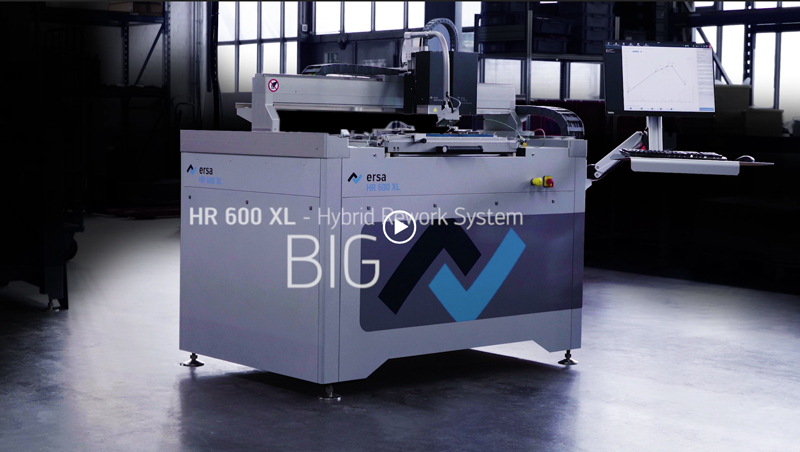 The axis system of the HR 600 XL has been equipped with high-precision spindle drives. 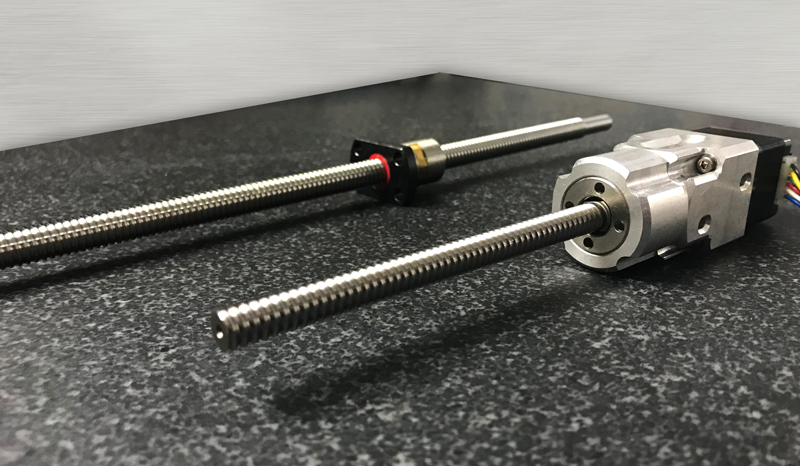 These are based on ball screws driven by a stepper motor. 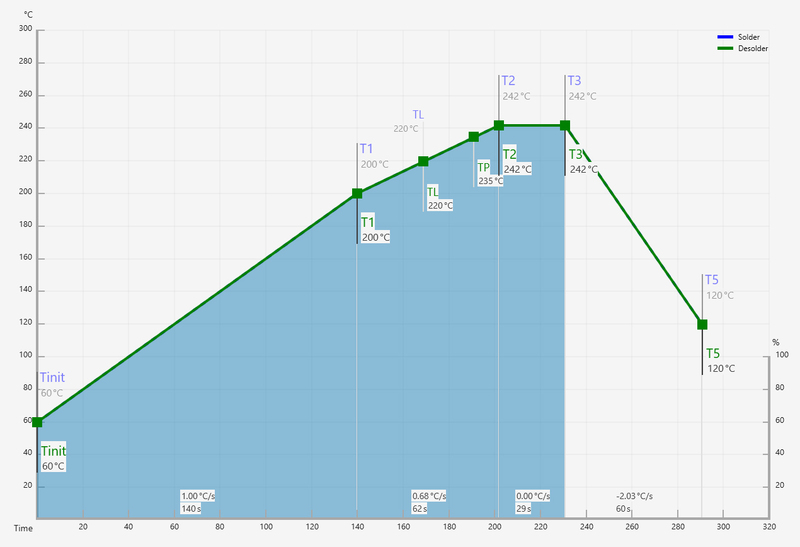 The travel distance on the X-axis is 1040 mm and 720 mm on the Y-axis. The repeatable accuracy of the axes is +/- 10 microns and the travel speed is 45 mm/s. An intrinsically safe operation is ensured. The touchdown forces of the Z-direction are approx. 0.49 N in the placing head and 0.39 N in the heating head. Components such as BGAs, QFNs or even 01005 chips can be picked up and placed by both heads. The bottom IR Matrix Heater with a total output of 15 kW consists of 25 individually controlled heating elements. This is a key component of the Hybrid Rework System. 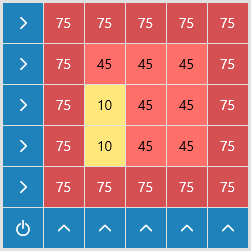 Each zone can be individually regulated, the temperature adjusted per zone and complete zones switched off when not required. The individual temperature zones are therefore adapted to the circuit board and components. Besides Hot Spots, whereby the heat output is focused on one component, homogeneous overall heat input can be arranged over the entire circuit board. Cold zones can also be defined for the protection of the board or components.